PaceMaker SIPs are comprised of APA rated OSB facers adhesively bonded to UL certified expanded polystyrene (EPS) insulation cores. Panel thicknesses range from 4 9/16" (R-16) to 12 9/16" (R-45) to meet insulation and structural requirements. Panels are available from 4'x8' to 8'x24' and can be factory fabricated to be site-erected quickly- reducing weather related delays, vandalism, and to speed project completion. PaceMaker SIPs have been used as roofs, exterior walls, and floors in virtually all building types- religious, fast food, educational, residential, and light commercial. 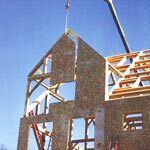 Engineered SIPs have been used in tens of thousands of structures since the 1970's. Large, pre-cut panels can be installed faster than standard materials and methods. Testing concludes that SIPs have better whole-wall R-value than stick and batt insulation. Testing shows that SIPs are 2-3 times stronger than conventional construction. Faster erection and less skilled labor result in a minimal increase in construction costs. SIPs have regenerable wood facers and high R-Value EPS cores (with no CFC's). They save energy and reduce air pollution.